Melt 1/4 cup of butter in a large skillet over medium heat. Saute green onions in butter until tender. Remove from pan, and set aside. In the same skillet, melt 1/2 cup of butter, and saute the crawfish for 5 minutes; set aside. 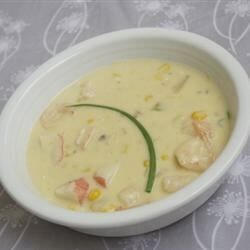 In a large pot over medium heat, combine potato soup, mushroom soup, corn, and cream cheese. Mix well, and bring to a slow boil. Stir in half-and-half, sauteed green onions, and crawfish. Season with cayenne pepper. Bring to a low boil, and simmer 5 minutes to blend flavors. See the simple secrets to making quick, creamy crawfish chowder. Made this tonight, exactly as recipes is written. Everyone loved it. Even my 3 year old son. It is very rich, so I will try to make it again with lighter ingredients. Great recipe!!! !